The fickle ambiance of Kashmir is once again slowly and stealthily trudging towards the nineties. The education and economic sectors which act as the backbone of a nation’s progress are once again dwindling. The peace has once again took an abrasive halt. The children who are the deciders of tomorrow are seen on roads and prisons instead of schools. They are the victims of the inscrutable politics of the two countries and bear the brunt of the conflict. They have the privilege of shaping the future, but they are busy hurling stones! Certainly, it looks like a void is in the making which would take decades of peaceful ambience and hard work to fill. The generation which we are losing and wasting is the great tragedy of our time. No words can define this tragedy. 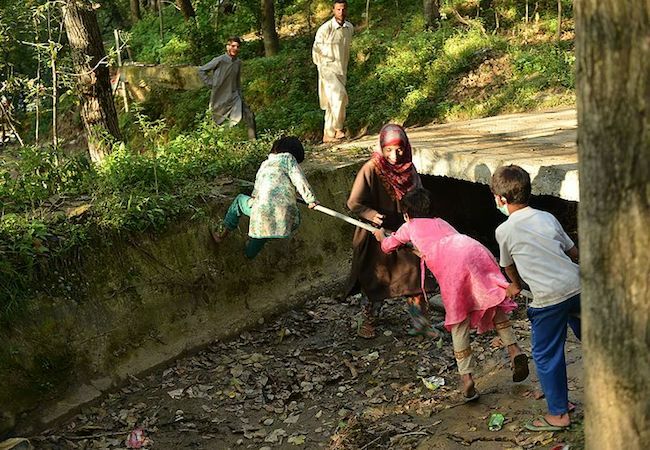 Keeping in view the present situation, the children who belong to well of families are being sent out of the state, firstly to get a sophisticated education and secondly to get some respite from the apoplectic turbulence and upheaval in which the valley is presently wallowing in. Distancing children from the unrest and engaging them on the track of nation building is a good move. But question arises that, are the children in a position to distance their minds from the turbulence which they are actually part of? Is it possible for them to take off their traumatized mind from their native place which is the highest militarized zone in the world? Can they forget the nocturnal raids, vandalizing of their houses and the daily harassments? Is it possible for them to shun the blood painted roads and walls bearing provoking graffities? Answer certainly lies in ”No”. What you are actually trying to say them that forget you had a friend who had studied with you and is now slain because he was holding a stone. Forget you had a companion who has lost his eyesight because of the lethal pellets when on his way to college. Forget that your acquaintance, accused of illicit activities was picked up late night and after that his whereabouts were never known. If the children won’t make you feel what they think about it or what they are going through, does it mean they don’t think about it at all? Living in the plains of India, their tongue may speak something else but their heart and mind is always surrounded by the trauma that reflects their entanglement in the conflict. You can scarcely distance their mind and heart from the turmoil. The trauma is realised, when they compare themselves with the other students belonging to the different states of India whose mind is exultant and repleted with lot of creative ideas. The whiff of the conflict is smelt there. The later possesses the diverse realisation of the world. But your mind would always end up at Kashmir. You can’t think beyond that. It is not the fault of the children that they have confined their mind but of conflict which doesn’t provide them enough spaces to contemplate beyond certain contours. After witnessing bloodshed, how much creative can a student sitting in a library or experimenting in a laboratory be? What kind of progress and creativity can be expected from him? They are the ones on whose shoulders the fate of your future lie. But when their childhood is exploited, the scene of the future should haunt you. The child of conflict is everywhere the child of conflict, be he in or out of it. But there is only one difference between the children who are wallowing in the turbulent ambiance and the ones living out of it. The difference can be understood by the William Shakespeares famous drama “King Lear”, where he talks about the internal and external storms. The children living in the valley are the victims of both the storms. They have external storm in the shape of daily upheavals, killing, maimings, incarcerations and restrictions and internal storm in the shape of mental trauma and an unabated anger within. The children who are out of it are the victims of later one only. The person living in the conflict can’t imagine what he is being deprived of. Because conflict has confined his mind only up to a stone. For redemption, it doesn’t let him think of any nonviolent mode of resistance like that of education. No doubt you can’t expect anything from the conflict, but if you fail to pull yourself out of the conundrum nonviolently, it would engulf you. Amid miseries you would only see darkness all around and your future generation striving in sheer agony. So, it is high time to take some nonviolent and concrete steps to save your future from the ensuing calamity. For it, the leadership (mainstream as well as seperatist) has a major role to play. The soon they would act, the better it would be. Aabid Rehman Pala is the student of English Literature at Department of English, Aligarh Muslim University. He hails from Frisal in Kulgam, Kashmir.